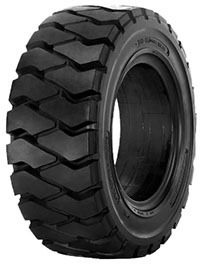 The newest product of the variety of forklift tyres, built with the latest industrial construction techniques. 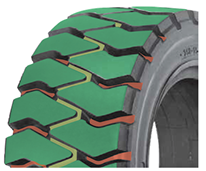 Its characteristics are the new pattern design and the bigger tread surface which improve stability and load dispersion on the ground. Built with a multi layered natural rubber compound process and a system of three different types of compound to assure maximum elasticity and comfort, reducing the consumption by abrasion, but not the tyre life. The sidewalls have been strongly reinforced to protect the tyre from lateral damages, and the particular bead profile prevents the intrusion of stones and other debris. Available also with non-marking and antistatic compounds for special applications and in easy-mount fast/click version to fit rims without locking.